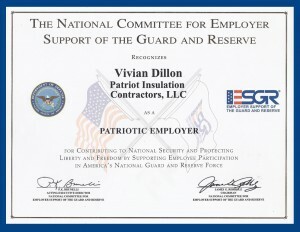 Patriot Insulation Contractors, LLC is a full service mechanical insulation contractor. Whether it is piping, duct, equipment, pumps, tanks, or boilers- commercial or industrial Patriot Insulation should be your contractor of choice. Lump sum projects or time and material maintenance contracts our office will work with your company to ensure you are a satisfied customer. In addition to mechanical insulation we provide through penetration fire stopping services. Our employees are trained and certified in 3M fire protection product application methods. We warrant our work for 1 year from date of completion and will provide labeling to help avoid the abuse that insulation systems, inherently low density by their nature and often easily damaged, incur by workers in the area not aware of the damage their actions can inflict on insulation systems. We are also pleased to announce that our company has two certified insulation energy appraisers on staff that can perform a mechanical insulation energy appraisal at your site. The power of insulation will truly be seen after an audit is conducted. The appraisal would include a walkthrough of the facility to take measurements, record operating temperatures, hours of operation, fuel cost data, and the condition of present insulation systems. A detailed report would then be generated to include pictures of problem areas, present insulation shortcomings and recommended improvements along with insulation systems that are in good shape and providing significant energy savings. The insulation energy appraisal can focus on energy savings or elimination of carbon equivalent and greenhouse gas emissions.